Dawn's Crafting: Whooppeee I found one! Technically, I didn't find them, they found me! Welcome to my latest follower Sam! 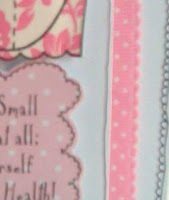 The Crafty Pad Challenge Blog! Make sure you stop by & check it out! Here's a sneaky peek to entice you over! I am sure they will look absolutely stunning as always Dawn. I can't wait to see the full photos. I'm glad you found one!! The special challenge looks interesting! I'm so glad you found a new follower. The sneak peaks look interesting!